Whether you’re a sports buff or the trendy guy in your posse, we’ve got ways to make your pad part of your image. If you are where you live, what does that say about the maintenance and effort you have to put into your home? Well, that all depends on what you want others to think about you. So if you’re decked out in expensive threads, your effort won’t mean much if your place is a disaster, or worse, not a reflection of you. Whether you live in a small apartment, a 1,500-square-foot condo or a three-level house, the home you call your own is your representative. And when a fine lady comes over to pay you a visit, you want to make sure she’s impressed by your space. You don’t need to be an interior designer or spend tons of cash to be proud of your pad. As long as you feel comfortable in it, you will hold your head up high… even while lounging in your favorite chair. These might seem obvious to you, but remember; making your home a reflection of you is worthless without knowing what your image is — or at least what you want it to be. No passions or traits have to be exclusive; you are likely an amalgamation of characteristics and that can be reflected in your home. The following are different broad categories that can be used as templates for decorating your pad, to bring out the “you” you’re going for (based on your profile). Remember; you can be a combination of each of these categories. Whether you’re usually glued to the TV watching the big game (and this can mean several simultaneous games) or love reciting sports scores with your buddies after scoring big in your own football game, sports are your thing. Show your appreciation by adorning your home with things like vintage sports jerseys and mementos. And of course, you can’t forget a widescreen plasma TV (50 inches or more) — made larger than life with surround sound — so that you can watch the game in style while sitting in a super cool recliner. When it comes to style, you’ve got it in spades — at least that’s what your friends tell you. You’re a leader who always knows the trends before they hit the streets and your posse relies on you to dictate the latest fashion. This character trait could get pricey when it comes to your home, which is why I recommend starting with a classic, neutral base for the expensive items (i.e. couch, dining table, etc.) and decking your pad out with ultra-hip accessories like cool lamps, trendy vases, a stylin’ coffee table, and cutting-edge gadgets. The ladies are always impressed by your appreciation for the finer things in life, be it your knowledge of fine wine, your travels to Botswana and Brussels, or your penchant for investing in valuable art. Make your pad your canvas by covering the walls with your favorite paintings, and rather than a table from Pottery Barn or Ikea, search for an antique table last used by Louis IVX. Store your wine collection in a slick wine cabinet and display your African masks in the living room. There’s nothing wrong with knowing your way around the kitchen; after all, you’ve been known to woo women with your creations. Show your female guests that you can satisfy their hunger (and more) by investing in a luxurious kitchen. If you enjoy spending time experimenting with food, make yourself more comfortable by installing a kitchen island, and treat yourself to an industrial-style stainless steel oven range. Pimp up your kitchen with a slick fridge or exhaust hoods, a rack to hang copper pots and pans over your oven or island, or, for those on a tighter budget, accessorize with appliances like a sleek toaster, blender and coffee maker. Show off your inner peace by placing fresh bamboo or stones in clear glass vases, or for a bigger investment, treat yourself to a Jacuzzi with jets in your favorite bathroom. Maintain a minimalist look with white walls and furniture, and an overall sleek decor. While this might not be a character trait you want to flaunt, you can spin your workaholic tendencies as “ambitious.” Set up a home office with a flat-screen computer, a state-of-the-art desk chair, and a slick table with a lot of organizational features to make you look like a guy who’s always in control. You don’t need to overhaul your home to give it that unique touch that’s “you.” If you’ve been living in your home for a while and are already settled in, sometimes a slight reorganization can do the trick, as can a paint job and some new accessories. Whether you are an investor that would like to get into buying foreclosed homes for your personal use or to flip the property or if you are having your home foreclosed on, you should know what to expect at a foreclosure auction. Of course, the actual steps that will be taken can vary a bit from state to state and from house to house, but it’s good to know what you will be getting into when you go to a foreclosure auction. Foreclosure auctions can be exciting, even fun, but knowing what to expect will help you make the most of the experience, whether you are an investor or a homeowner that is trying to get your house back. You’ll likely find out about the foreclosure auction in a local newspaper and on the flier may be information to pre-qualify for bidding. This will allow you to put down a deposit so that the auctioneer knows that you are a serious bidder and can fulfill your bid if you are the winning bidder. Being pre-qualified just sort of speeds up the process so that you don’t have to mess around with the deposit on the day of the auction. During this time you should also do some research on the house by looking into any liens that may be against the property, how much the property is worth, how much it has appreciated in the last few years, as well as property values in the area. If the home looks as though it will need some repairs, you should consider this as well when trying to come up with how much you will be willing to pay for the house. Without this research, no amount of knowledge about what goes on at a foreclosure option will help you because you won’t know where to start when it comes to actually making a good bid. The auction will typically start with the auctioneer reading legal notices as well as a legal description of the property. The auctioneer will usually then begin taking bids on the property. If the auctioneer has pre-qualified bidders the process is more streamlined, if not, each time a bid is made the auctioneer will then ask for the bidders deposit check, which is typically right around $5,000 for residential auctions. After each bid the auctioneer will attempt to solicit bids for higher amounts. Each auction is different, but the auction increments usually are set by the auctioneer and may be by $100, $500, or $1,000 per bid. The auctioneer will continue to solicit bids by this increment until it is clear that the highest bid has been reached. Then, the auctioneer will announce, “Going once, going twice, three times, sold!” indicating that the auction is over and the property has been sold to the highest bidder. Once the bidding has ended a foreclosure deed and purchase papers will be drawn up and validated by the new owner or purchaser and the mortgage holder. A grace will likely be given to allow the purchaser to find financing or to come up with the funds to cover the full amount of the bid. This grace period is usually 30 days unless the purchaser and the mortgage holder agree to other terms. After the grace period a closing will take place, so that the new owner can formally take the title to the property. The purchaser can do what he or she intended to do with the property, whether it is to move into the home or to sell it for full market value. The money paid by the purchaser will be distributed in order of priority, first of which would be taxes. After taxes money will be paid to the mortgage, then the second and third mortgage if applicable. If there is still money after paying these debts, remaining money will be paid to lien holders and creditors. There is a very slim chance that there will be money left over after all of the debts are paid, if this is the case then the monies will be paid to the former home owner. What about the Original Owner? The original owner will often be at the auction so that they can bid on their home, and this is legal as long as they have the deposit required. If the owner of the home that has been foreclosed does bid on the home they must remember that the deposit is not refundable and the deposit assumes that they will be able to finance the home within the grace period. Owners must also remember that if they buy the property back old debts may merge and become reinstated such as second and third mortgages that became void when the first mortgage foreclosed on the property unless one has filed bankruptcy and is truly free and clear of these debts. Owners will often drum up the funds to make the deposit so that they can have another 30 days to try to save their home. Owners may or may not be successful in their attempts to save their home at a foreclosure auction. As you can see, there are a lot of things that go into a foreclosure auction, but none of them are all that difficult to understand, but knowing about them makes the auction more enjoyable. The auction itself is not all that complicated, but it can be very fast paced. At some foreclosure auctions there are a lot of people, at others there are only a few because of the location or just the debts attached to the property, or even the state of the property. If you are serious about the property you should pay close attention when bidding starts so that you are sure that you can get your bid in when you feel it’s time so that you have the best chance of being the top bidder. Your bathroom, one of the rooms you clean most, hides areas that rarely see a scrub brush. It’s time to tackle these 5 nasty spots you probably forgot. But we presume you or someone else regularly swishes out the toilets, wipes out the tubs and sinks, and mops your bathroom flooring. 1. Showerheads: A warm white vinegar bath will get rid of mineral deposits, making yourlow-flow shower head flow even lower. Let the showerhead soak for about 20 minutes, then poke a paperclip into shower head holes still clogged. Scrub with an old toothbrush, then rinse and repeat if necessary. 2. Toilet bases: Mildew can grow on the caulking around the base of your toilet. Spray with white vinegar or disinfecting household cleaner, then scrub with a hard-bristled brush. Dry thoroughly. 3. Shower curtains: Clean soap scum and mildew from plastic shower curtains by tossing them into your washer on the gentle and cold (never hot!) water cycle, with detergent and ½ cup vinegar. If mildew is present, add ½ cup of bleach instead of vinegar. Toss a couple of large towels into the machine to act as scrubbers. Hang curtains back on your shower curtain rod, spread them out, and let them drip-dry. If you turn on the bathroom fan, they’ll dry faster. 4. Drains: We don’t usually pay much attention to drains until they’re clogged. But all year your hair, toothpaste, shampoo, and conditioner are building up in sink and tub drains. Remove the stopper — unscrew the shower drain — and clear away obvious gunk, like hair and soap. Soak the drain in vinegar to clear away mineral deposits. Then, pour boiling water, or a mixture of ½ cup white vinegar and ½ cup baking soda, down the drain, which will bubble away crud sticking to pipes. 5. Medicine cabinet: Throw out prescription and over-the-counter drugs you no longer need or want. But don’t dump them down the drain, where they become part of the watershed, or into the trash, where anyone can fetch them out. Instead, take them to a local collection site, often at police or fire stations. Or check U.S. Drug Enforcement Administration’s National Take Back Initiative’s website for dates and sites for their next collection. Bonus tip: Just for the fun of it, launder those powder room towels you won’t let anyone use. And be sure to clean out your dryer’s lint filter when you’re finished. If pets, kids, or wine have left their mark, invest in a professional cleaning. A pro will run between $1.50 and $3 per square foot of rug, depending on the type of rug. Delicate natural fibers are usually more costly to clean than synthetics. For appliances with less room to maneuver, attach microfiber cloths to a yardstick with rubber bands. Slide and grab under and between appliances. For oily or grimy buildup on ceilings, especially in the kitchen or bathroom, run a flat mop tool with a microfiber or soap-cloth attachment along the ceiling. Dish soap will do nicely. Check that the caulk at the base of the toilet is sealing the area. If it’s worn, remove the remaining caulk with a utility knife. Then re-seal it. For extra germ-fighting, choose a caulk with Microban. If you don’t see mold, check your vapor barrier for holes, deterioration, or uncovered areas. If you’re handy and comfortable with working in cramped crawlspace conditions, you can fix it yourself with supplies from your local hardware or home store. Otherwise, call a handyman. If the problem seems more extensive (major holes or large uncovered areas), call a foundation specialist. Make sure there’s no standing water on top of the vapor barrier. That could mean water is coming from leaking pipes or gutters. It’s a recipe for mold and rot. Call a pro who specializes in foundation or crawlspace work pronto. NO CLUTTER. Throw out old newspapers and magazines. Pack away most of your small items like figurines and other trinkets. Store clothing that won’t be used in the near future to make closets seem roomier. Clean out the garage. Buyers like to visualize their possessions in the house and that is hard to do when the home is full of clutter. Wash your windows and screens. This lets more light into the interior and dirty windows are a turn off. Keep everything extra clean. Wash fingerprints and dirt from light switch plates. Clean the floors, stove, refrigerator, washer and dryer. A clean house makes a better first impression and tells buyers that the home has been well cared for. Put brighter bulbs in light sockets to make rooms appear brighter, especially dark rooms. Replace any burnt-out bulbs. Turn all lights on before buyers come to view the home. Make all minor repairs that you can find. Everything you don’t repair now will be revealed in the home inspection and can create a bad impression. Small problems such as sticky doors, torn screens, cracked caulking, cracked receptacle covers or a dripping faucet may seem trivial, but they’ll give buyers the impression that the house isn’t well maintained. Shoot for good curb appeal. Cut the grass, rake any leaves, trim the bushes, and edge the walks. Put a couple of bright potted flowers near the entryway to cheer things up and get the buyers attention. Polish or replace your front doorknob and door numbers. Get rid of smells. Clean carpeting and drapes to eliminate cooking odors, smoke, and pet smells. If carpets are old and need replacing, it is worth while to replace them. The additional price you receive for your house will most likely outweigh the expense. Open the windows. The number one turn off to a potential buyer is an unpleasant odor. For more helpful information including seller and buyer tips, contact Laura Key today at 310.866.8422! Roses are red; violets are blue — here are romantic improvements that add value, too. What makes your honey feel better than a long, soothing shower? (OK. It’s a rhetorical question.) But showering exactly the way you want it is a little luxury that can set the mood for a lot of love. Programmable showers ($290 to $3,500) let you digitally determine water temperature, pressure, even type of spray. Pulsating, anyone? And if you want things to get a little steamy in the bedroom, start in the bathroom with asteam shower ($7,000 to $10,000). You’ll need space to put the steam generator — an adjacent closet will do — and you’ll have to make your shower airtight to trap the steam. Or you can buy a prefab unit ($1,000 to $5,000) that you can install yourself or hire a pro to do the wet work ($500 to $1,000). We know you’ll want to be extra clean and coiffed for Valentine’s Day night, so get ready for the fun with an electronic toilet seat that washes and warms, plays music, and sprays pleasant scents. A couple of years ago, these deluxe seats were hard to come by. Now, big box stores around the country sell these bathroom accessories that fit on top of your toilet ($150 to $600). They come with a host of features, some with slow-closing lids and germ-resistant seats. If you want to go whole hog, buy complete high-tech toilets that also include LED lights for late night bathroom breaks and no-touch flush ($450 to $1,100). Help romance along by avoiding harsh overhead lights and instead installing dimmers on bedroom lights ($16 to $38) or just replacing a few lamps with lower wattage bulbs. Not only will dim lighting set the mood, but lowering brightness extends the life of bulbs,saving energy and money — and what’s sexier than that? Isn’t it romantic to listen to music in the dining room, bedroom, even the bath? You can go high-end — and high-effort — and have a sound specialist install whole-house sound, which entails running speaker wires through ceilings and walls ($700 to $2,700 per room), and hooking up a pair of speakers ($100 to $2,000 each pair). Or, you can save some money and install a wireless system yourself. The music is distributed by a computer and sent via router into small player boxes in each room ($400 per room). This DYI project takes a couple of hours. Lounging by the fireplace on Valentine’s Day, sipping champagne, eating chocolate-covered strawberries is a dream celebration. But, let’s get down to earth and just settle for the fire. If you already have a wood-burning fireplace, sweep it out and perform chimney maintenance so your V-Day doesn’t go up in flames. If you’re missing a place for flames, you could go all out and add a fireplace. If you have a wood-burning fireplace one but never use it because of the hassle, you can retrofit with agas fireplace insert that gives you light and heat with just a flick of a switch ($3,000 to $4,000). Or, if you’re in a hurry, install a plug-in, electric fireplace that supplies a realistic-looking flame and even heat. Installation is a DIY project. Your biggest hassle will be selecting the location — along a wall or stand-alone — and picking the most romantic-looking mantle surround or fireplace shelf (with mantle package $800 to $1,600). 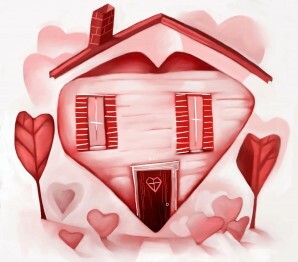 Tell us what you love about your home. Love Those Baby Wipes! – Great Home Ideas! Makeup Remover: A few swipes with a baby wipe and makeup is gone. Removes crayon marks from painted walls or finished furniture. Clean up shards of glass off floors after an accident. Touch up bathrooms between cleanings. Clean dashboard and car interior. Remove “white marks” from deodorant on clothes. Wipe down shower or tub after each use to prevent soap scum. Remove hairs from a shedding pet. Remove scuff marks off of floors. Cool a sunburn by patting it with a baby wipe. Touch-up floors. Put a wipe under each foot. Scoot feet along the floors. Electronic Screen Cleaner: Use them on TV, cell phone, iPod and computer monitors. Remove bird splatters from car windshields. Wiping down restaurant tables, high chairs, shopping carts, changing tables and toilet seats in public places. Place a few drops of your favorite essential oil on a wipe and place it in a dresser drawer as a sachet. A must have on camping trips – good for cleaning yourself when a shower isn’t available.